My new lab is different: we’re not getting patient specimens for testing, and we’re not reporting results to doctors. We’re a manufacturing lab, taking plasma, unsuitable for donation because of antibodies, and making a useful product out of it. It’s an entirely different world from the hospital labs I started in, and I’d like to give you a window so you can peek inside. Here’s an anecdote and a description of one of my tasks for you. One of our big pieces of equipment in the lab is a liquid nitrogen tank, where we keep rare cells, frozen in little vials. We need to go in and retrieve them for testing sometimes, depending on what project is underway, and nobody enjoys doing it, because it’s cold in that tank. About -180C on average. We put on big blue gloves worthy of an Antarctic expedition, pop up the lid, and then reach in and pull out one of the vertical racks submerged in liquid nitrogen. Each rack has several shelves, and on each shelf is a little cardboard box containing a selection of vials. We have to pull out the rack, lean it horizontally in the tank so it stays cold, then pull out the right box, tip it to pour out the liquid nitrogen, and then sit it on the tank edge to open it and pick out the right vial. Of course, as I turned back to put the lid back onto the box of vials, I bumped the box with my clumsy blue gloves and then gasped as the box flipped over into the tank, releasing fifteen vials of valuable cells into the liquid below. First I yelped, then I cursed, then I sighed. Peeking into the tank, I could barely see through the fog created when the cold condenses the water vapor out of the air, but somewhere under the clouds I could see white caps bobbing at the surface of the nitrogen, daring me to reach in for them. Considering my limited options – human hands, even in big antarctic gloves, don’t react well to immersion in liquid nitrogen – I went looking for my supervisor. As it turns out, I wasn’t the first to dump vials into the tank, but that didn’t make me feel much better. My supervisor rigged a scoop out of a huge pair of pliers and a small sieve, and we went fishing. The floating vials came up pretty easily, but the others were more of a challenge, requiring some digging and scraping of the ice at the bottom to dislodge the vials that had filled with liquid nitrogen and gone down. We got them all, but not until after I knocked one back into the tank while trying to stuff it into the box. Lucky for me, my supervisor found this funny enough to almost choke to death, instead of being frustrated with his twitchy underling. When I’ve done everything right, the final product from weeks of effort is a huge glass vessel full of processed and purified serum – it can be up to 30 liters, but usually it’s closer to 15 or so. It has preservative in it to prevent microbial growth, but nonetheless, It gets put through an extremely fine filter before we proceed to fill our final 3- or 5-mL product vials. Those suits are made of a synthetic, plastic-like material so they don’t shed fibers, which also makes them very warm! I’m glad I only need to put on the “bunny suit” every few weeks. It’s not exactly a flattering look for me. We have a filling session once a month on average, and it can take almost a whole day for the bigger volumes. While we’re in the room, we perform environmental monitoring to check for particles and bacteria or molds in the air, and we wipe everything down, especially our hands, regularly with alcohol foam. At the end of the process, we touch microbiology plates with our fingers to see if we did a good job staying clean. If anything grows, we’re in trouble. As one person fills the vials, someone else puts caps on them and secures them gently. The vials sit snugly against each other, about 250 to a metal tray, so this part is tricky, especially with gloved hands slippery from alcohol gel. 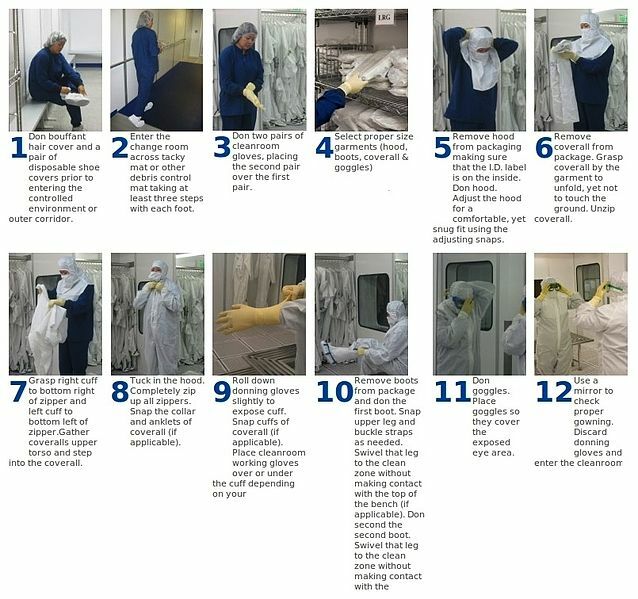 Outside of the clean room, we tighten the caps all the way, re-check the count, and then secure the product in a tamper-proof box or wire cage. At this point, the vials are unlabeled, and since a vial of plasma looks like a vial of plasma, we wouldn’t be able to tell two products apart if we mixed them up. We keep everything apart and clearly labeled on the outside, and we make sure that the area is completely free of any other product before we take them from their secure storage to label and inspect them. It’s so very different from what I was used to in the hospitals, and yet the concepts are the same. Quality control, attention to details, careful labeling – you’ll see this in any lab you visit. While the context might change, and the products and results labs put out will vary, you can be sure the techs behind the work are referencing Standard Operating Procedures and following the rules. Because what we do matters, and we know it. This entry was posted in Uncategorized on April 26, 2012 by antijen. Wow, your posts have been so interesting and informative!! I have a question: do you actually run periodic tests to be sure there are no microbes and bacteria floating around in the “clean room” air, or is there a monitor of sorts that tells you those things? Also, a more general question: were you ever bothered by working in gloves all day? Is that something that just never really bothered you or did you get used to it over time? I’ve found that some types of gloves (the blue ones, I think they’re latex free) get my hands all sweaty and icky quite quickly, but other types (ones that do have latex) aren’t bad at all. I wonder if the difference is in the latex. I think the blue ones don’t have powder either though – that may be a more likely explanation. I’m starting my Med Tech program at Univ of Washington in September. I’ve done some undergraduate research working with cells (splitting them on plates, transfecting them with DNA – and we have the big liquid nitrogen tanks full of cells too – cannot imagine dropping a bunch of vials in there! ), but otherwise I have very limited lab experience. So this stuff is incredible interesting to me. I hope you’ll keep the posts coming even though lab week is over! The gloves don’t bother me, but there are different brands and thicknesses, and some are much more comfortable than others. Almost every workplace is latex-free now, due to the risk of allergies. You’re most likely to encounter nitrile gloves, and possibly vinyl ones – I find that the vinyl ones are the worst in terms of sweating. As to your clean room question: the room is kept under constant positive pressure, and it’s also thoroughly sanitized and checked for bacteria prior to each use. We press agar plates to certain surfaces and incubate them to check for growth.